Rochester Root Beer Review by Handy Father. Today we got some root beer from our local root beer stand. We’re told that it is Rochester Root Beer. It is a root beer commonly marketed to root beer stands, and is mixed on location, and touted as “real root beer”. We purchased 1/2 gallon of the root beer stand Rochester root beer. It is fairly dark in color, and had great head on location when it was first poured into the 1/2 gallon milk jug. When we poured it into a frosted mug 30 minutes later, it was refrigerated, but as expected, less carbonated and with less head. It has little smell, but has a good root beer flavor, sweet, but the flavor doesn’t linger. Unlike many other HFCS root beers, it doesn’t seem to coat your throat with a sugary syrup. It was a pleasant surprise! The smooth flavor is easy to drink. We give the Rochester Root Beer Review a 3.75 out of 5 stars for its subtle flavor and overall drinkability. Ingredients: High Fructose Corn Syrup, Caramel Color, Corn Syrup, Water, Gum Arabic, Propylene Glycol, Natural And Artificial Flavors, Yucca Extract. How it’s Made: To prepare Root Beer Syrup: Dissolve 38 pounds sugar in 4 gallons 20 fluid ounces of water and then add 1 gallon of concentrated root beer syrup. Mix well. Yields 8 gallons Ready-To-Use Root Beer Syrup. 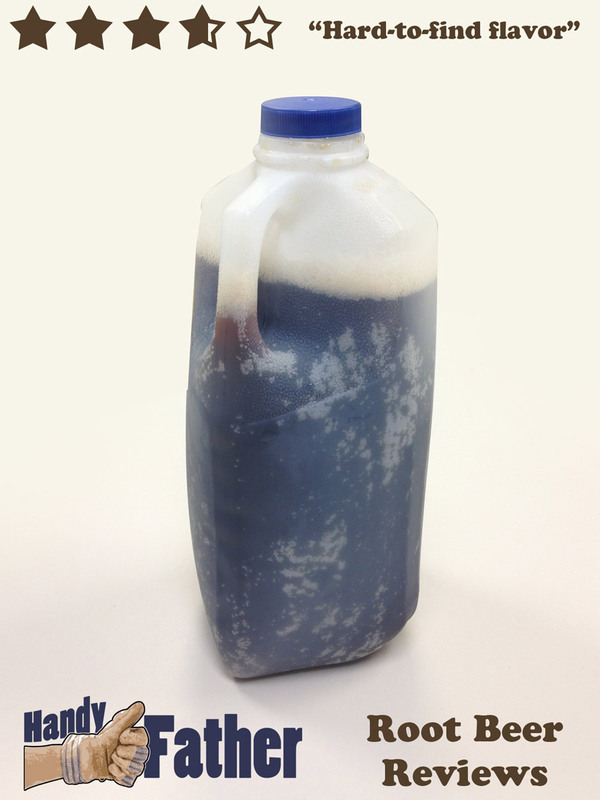 – To prepare Root Beer (finished product): Use one part Ready-to-Use Root Beer Syrup with five parts carbonated water. The Rochester Root Beer is distributed by ConAgra Foods, and is marketed under the brand of J. Hungerford Smith. You will be hard-pressed to find Rochester Root Beer anywhere except in root beer stand / drive in restaurants. For sure, you can get this tasty root beer at Shopoff’s Drive-In in Syracuse, Indiana.